In one insider's opinion, Infinity Ward will never be the same due to recent departures. Ever since former Infinity Ward heads Jason West and Vince Zampella were ousted from power by Activision, only to form their own new studio, the future of IW has been in doubt. 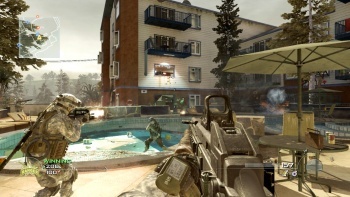 Infinity Ward will always exist due to the popularity of the Modern Warfare series, but an insider recently told Kotaku that the studio once known as one of the best in the business is not what it was, and never will be again. Insider comments should always be taken in caution, as you never know if they're that of a disgruntled employee or someone that really knows what he/she is talking about. Nevertheless, the insider stated that Activision is "scared shitless" due to the departure of veteran IW members, and also over the formation of Respawn Entertainment by West and Zampella. "IW as you know it is dead...and it will continue to crumble. There are a lot more veterans who are definitely going to leave," the insider continued. He also called West and Zampella "amazing leaders," and said that there is "there is nothing [Activision] can do to gain our trust or respect, and I'm pretty sure they know it now." The last comment emphasizes why this certain insider could just be really angry about the situation, but it doesn't mean that he isn't correct about further departures as also predicted by analyst Michael Pachter. A positive insider from Activision has also stepped up to duel the negative insider, telling Kotaku that "[Infinity Ward] is not dead, we definitely lost original team members, but not all of the talent ... that will get us to where we need to go, and now is the time to find our new leaders." The real question in my mind is: can Respawn Entertainment create a series that can compete with Modern Warfare 3? Modern Warfare will pretty much always sell no matter what, but can a brand new series command the attention of an audience that the majority of probably hasn't heard about the shake-up surrounding Infinity Ward?